Alternatively referred to as the mb, mainboard, mboard, mobo, mobd, backplane board, base board, main circuit board, planar board, system board, or a logic board on Apple computers. The motherboard is a printed circuit board that is the foundation of a computer, located on the back side or at the bottom of the computer chassis. It allocates power and allows communication to the CPU, RAM, and all other computer hardware components. Motherboard form factors and types. How many connections, ports, or slots are on a motherboard? How does a motherboard connect to a computer case? Since there is a motherboard, is there a fatherboard? Where did the motherboard get its name? Is there a motherboard in a laptop, smartphone, and tablet? A motherboard provides connectivity between the hardware components of a computer, like the processor (CPU), memory (RAM), hard drive, and video card. There are multiple types of motherboards, designed to fit different types and sizes of computers. Each type of motherboard is designed to work with specific types of processors and memory, so they are not capable of working with every processor and type of memory. However, hard drives are mostly universal and will work with the majority of motherboards, regardless of the type or brand. 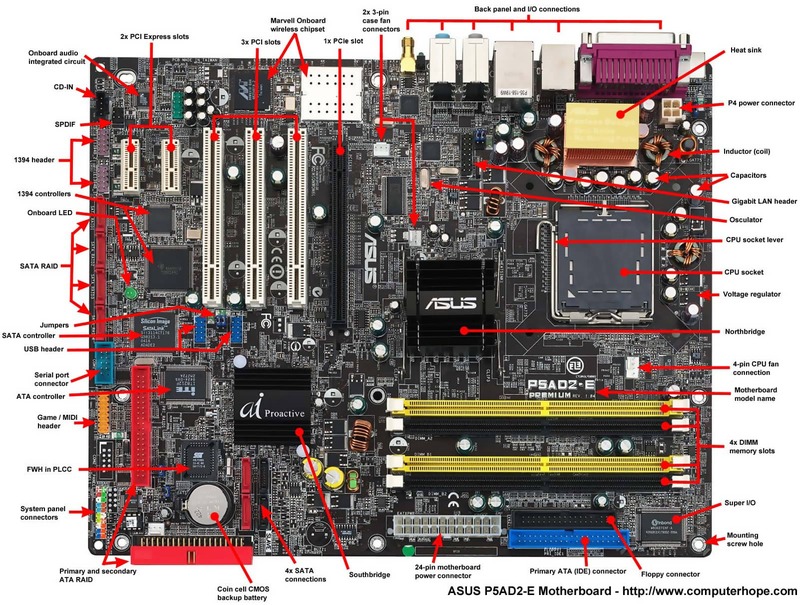 Below is a picture of the ASUS P5AD2-E motherboard with labels next to each of its major components. Clicking on the image directs you to a larger and more detailed version. Below are links to pages with more details for each of the motherboard components mentioned in the previous section. The links are listed in clockwise order starting from the top-left corner of the image. Components not labeled on the image above can be found in a section later in this document. Expansion slots (PCI Express, PCI, and AGP). ATA / IDE disk drive primary connection. 24-pin ATX power supply connector. Coin cell battery (CMOS backup battery). The following list contains links to components that are not shown in the picture above or were part of older computer motherboards. Game port and MIDI header. Obsolete expansion slots: AMR, CNR, EISA, ISA, and VESA. Screw hole aka mounting hole. As computers advanced, so have motherboards. Below is a listing of the various motherboard form factors and additional information about each including ATX, which is the most common. There is no set standard to how many connections, ports, or expansion slots are on a motherboard. The best method of determining how many connections, ports, or slots are available for your motherboard is to look up the specifications contained in its documentation. If you've lost or discarded your motherboard's documentation, you can often download a free PDF version from the manufacturer's website. How do I determine which computer motherboard I have? A computer motherboard connects to a desktop computer case using standouts. Once it is attached to the case, all the other devices connect either to the motherboard itself, or an inserted expansion card. How to install a computer motherboard. The first motherboard is considered to be one used in the IBM Personal Computer, released in 1981. At the time, IBM referred to it as a "planar" instead of a motherboard. The IBM Personal Computer and the motherboard inside it would set the standard for IBM-compatible computer hardware going forward. No, there is no such thing as a fatherboard when referring to a computer. However, there is such a thing as a daughterboard. The daughterboards we mentioned in the previous section are circuit boards that all plug into one larger central circuit board; a motherboard. The smaller boards can be thought of as the main board's "children," hence the name motherboard. Yes, although the board is often referred to as a logic board and not a motherboard. The logic board is very similar to a motherboard and operates the same way. However, because of size requirements with most logic boards, the components like the processor and RAM (in tablets and smartphones) are soldered onto the board. Also, because many of these devices have no upgrade options, there are no slots or sockets that would support a replacement or upgrade of components like a traditional computer motherboard. Computer motherboard manufacturers and related links.